Most people looking for a home have a ‘wish list’; a set of criteria which they believe encompasses their main requirements in a new property. These lists are compiled sub-consciously and consciously, sometimes over many years. They can change and adapt over time, and of course they can grow and shrink as life events influence them. One of the challenges which all buyers face is that final decision to buy. Human beings in general hate making decisions. Even ‘Type A’ personalities, those with strong convictions and a dominant nature, can start to falter when a decision of such huge proportions and impact needs to be made. I have personally sold over a thousand homes in my 15 years in the business, my team have collectively sold thousands more. When we talk in detail about the challenges facing buyers, one word always comes up; compromise. Whether you’re looking up to £100,000 or £10m, all buyers need to compromise. The ‘perfect’ property simply doesn’t exist. Like everything in life, perfection is an aspiration rather than a reality. There isn’t a perfect home, a perfect job, a perfect partner. Living with ‘things’, both animate and inanimate, involves compromise and understanding. It’s just how it is. I like to call them ‘perfect imperfections’. Buyers always err on the side of caution when choosing a home. This is natural. It’s a huge financial and emotional commitment. there is nothing irrational about this. However, one of the saddest parts of my job is speaking to people who saw a home in June, discounted it because there were a couple of things that didn’t meet their ‘wish list’, and then come back in August only to find that the property is now sold to someone else. What’s happened throughout that time? The answer lies in the ability of an individual, having viewed 10 more homes in their chosen area, to make a conscious decision to compromise on their wish list. They can only make this decision having seen alternatives, made compromises, and re-assessed which homes met with most of their criteria, rather than all of them. In this way, estate agency isn’t a sales role. It’s a psychological one. Personally, I believe that when these scenarios occur, where buyers regret not choosing a home that was clearly right for them, we have failed them as estate agents. We don’t sell homes; that kind of brashness is best kept in the 80’s where it belongs. But we should be prepared to have clear and objective conversations about the compromises that buyers will need to make in choosing their next property. If we’re not prepared to do that, then we’ve failed our customers. There is a fine line here. We need to be confident in our discussions about compromise without sounding like we’re patronising or belittling the needs and wants of the buyer. I thought about how I could use the concept of paradigms to help my buyers in their decision making process so that they could easily come to their own conclusions about compromise rather than be told, instructed or worse, sold to. I constructed a ‘home buyer’s paradigm’ based on these fundamental psychological principles. I had no idea at the time that this would change the customer experience in my business altogether. Before we start, it’s important to understand that the success of any paradigm in helping any process is the acceptance that the details of the paradigm are correct. How can I prove the validity of the paradigm if the assumptions are wrong? As this isn’t the British Journal of Science, you will forgive me if we assume that the fundamentals are correct. In terms of validity, I have some evidence to back up my claims. Since 2013 we have asked every customer registering to buy ‘what are the most important things to you when choosing your next home’. This has fuelled the concepts below. The results of the outcome options were so clear that there is little need for further evidence (the four criteria in the paradigm made up over 98% of responses given). This is a ‘statistically significant’ result for the purposes of research. 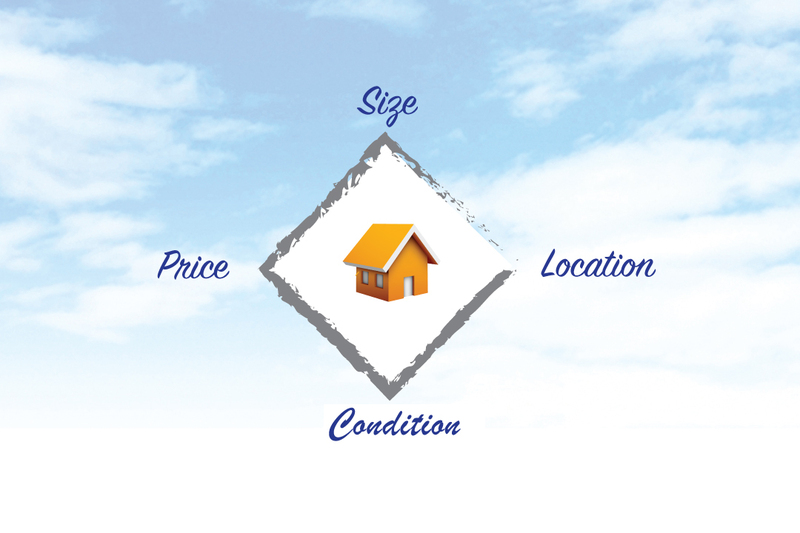 The paradigm is a clear and concise summary of the main buying criteria in a home. The crucial element of the paradigm is that compromise is a fundamental aspect of the decision making process. From the 4 criteria above, you should aim to secure a home matching 2 of your criteria, but in order to do so you will need to compromise on the remaining 2 criteria. A family have a maximum budget of £750,000 and are looking for a well presented 4 bedroom house within the catchment area of a good local school. Whilst they will be able to find a home in their budget, they may need to compromise on the number of bedrooms and be prepared to do some work on the property. 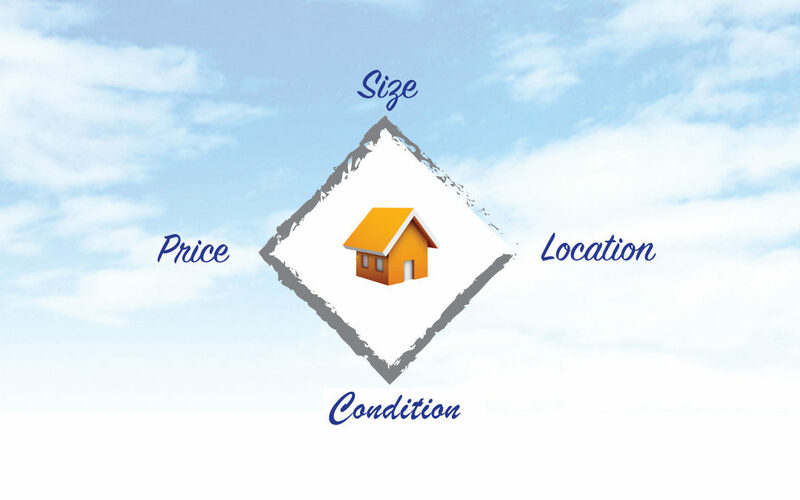 Using these 4 fundamental criteria, and selecting 2 of them gives a visual and indicative realisation that in order to meet some of the search criteria, buyers need to compromise on other elements of their requirements to find a suitable home. I haven’t collected the data of exactly how many times I have used this graphical representation to illustrate compromise, but I can safely say it’s in the thousands. In my time as an estate agent (the real job of meeting people and showing property, not the operational and strategic stuff I do now) I have scribbled this paradigm on the back of a set of details hundreds, if not thousands of times. In my experience, I have found that buyers have to make these decisions for themselves. There’s no point telling them it’s the best property for them, they have to discover that by weighing up their criteria and working out which things they can compromise on and which they cannot. By using the ‘choose 2 of the 4 which you can’t compromise on’ rationale, like the examples above, buyers can clearly see where their priorities are and then make their own choices based on the properties available. For buyers, this will reduce the time and effort in finding a home, streamlines the decision making process, and provides a clear visual representation of their search criteria. For estate agents and property professionals, it explains the psychology behind the buying process and helps construct and articulate the essential aspects of a buyers search and their key criteria. By understanding what is achievable and what isn’t, buyers will not only be more likely to compromise, but will find that their search is easier and less stressful. Every property is different, but by using this paradigm the process can become clearer, and with increased clarity comes an increased ability to make an objective decision as well as an emotional one. Whether your a first time buyer, portfolio investor, or looking for the ‘forever home’, try using this paradigm to work out which things you can and can’t compromise on. If you work on the basis that you will only truly meet 2 of the 4 main criteria, then it will help and inform your decision making process. If you’re an estate agent, try discussing these theories with your buyers. This isn’t selling, this is advice constructed carefully from many years of anecdotal research into the psychology of decision making. If it helps just one person not to miss out on the property that was clearly right for them, it will be worth it. Don’t forget that your clients (sellers) will also be expecting you to be capable and informed advisors and be prepared to encourage buyers to compromise, thereby increasing the chances of their home selling quickly and at a fair price. Let me know how you get on, and if you’re thinking of buying and need some impartial advice, get in touch with me. I’d be happy to help you! Jason Tebb is the Founder and CEO of Ivy Gate, the multiple award winning estate agents with offices in the UK, the Middle East and USA.